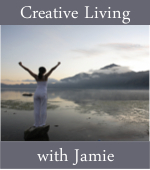 So if you’re wanting to know a bit more about the story behind The Rainbow Way and how YOU can cultivate creativity in the midst of motherhood, do check out my interview with the awesome Jamie Ridler of Jamie Ridler Studios. I’ve had a big fan-girl crush on her since I discovered her when we were both on Leonie’s World’s Biggest Summit – here’s my talk on Honouring Your Crazy Woman – it was my first telesummit, and I have just started writing The Rainbow Way, whereas she was an established pro. She’s interviewed so many of my heroines including Jen Louden, Brene Brown, Julie Daley, Miranda Hersey of Studio Mothers, and a pair of creative authors who inspired my online book launch. So I was VERY honoured to be invited to speak with her. And then I got really, really scared. And sick. And beyond freaked out. And postponed our interview. I daren’t listen to it myself. The sound of my own voice recorded brings the anxiety flooding back. I hear every stumble and strangeness. So will you listen to it, my love, and tell me what you get from it? If you haven’t gotten yours yet, Amazon Kindle versions of my new book, The Rainbow Way: Cultivating Creativity in the Midst of Motherhood are STILL topping the Amazon charts!!! Kindle versions are currently 99p in the UK/ 99c in the US plus tax and apparently a ridiculous 87c in Australia JUST until the end of January. The best price on paperbacks is from The Book Depository at 29% off and FREE worldwide postage.